Perfect eats before the football. Well done Wharf. The system made me put a comment. Amazing staff, delicious food. Could not be happier with our dinner date at the Wharf Hotel. Can’t wait to go back! Great for after work drinks and light snacks! Drink specials are quality and music is nostalgic! Great views . Good service. Good food. Will return. Great atmosphere. Quiet Saturday afternoon. We were able to spread out and relax. Great food and excellent service & atmosphere. Extremely disappointed when I paid the bill. 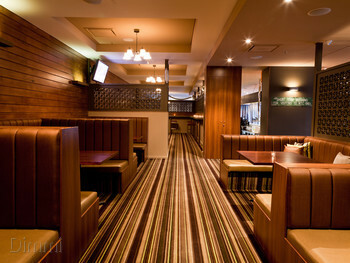 The website had advertised the Yarra Beach Bar as $59pp and $19pp for kids under 18. We had 4 adults and 4 kids but had to pay the full $59 for everyone. Extremely disappointed with the additional $160 charge. Very misleading advertising. Was a great day out and the food was very good. Great views. Good and friendly service. Nice food. Sip, eat & play at The Wharf Garden Party $49pp | Saturdays from 2pm-4pm Sip on bottomless low sugar cocktail jugs, plus nibble on a healthy grazing platter, perfect for sharing with friends. Terms and Conditions: - Confirmation of your booking is required 48 hours prior to your booking time, don’t worry we will call to confirm! - We take the credit card as a security only. Nothing will be charged to your card. Your bill is to be paid in full at the arrival for your reservation, the package will begin after that. - If you choose to cancel your reservation less than 48 hours before your booking time or fail to show up, there may incur a charge of 50% of the set menu price charged to the card provided at time of booking. - Tables will be allocated by the venue. - When notified of food allergies & intolerances we will take all due care to ensure meals or beverages served are free from notified products. However, we cannot guarantee that the meals or beverages will be free from trace elements. Please ensure that you notify us of any requirements 48 hours or more prior to booking. 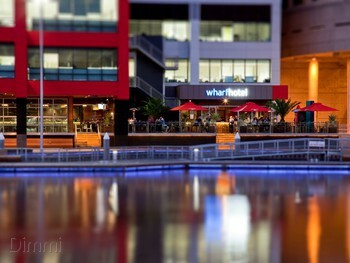 $49pp includes Wharf Platter and a choice of beverage to share. Igloos are suitable for groups 4 - 8pax. TERMS AND CONDITIONS ● Confirmation of your booking is required 48 hours prior to your booking time, don’t worry we will call to confirm! ● We accept all major credit cards or cash. ● We take credit card details as security only. The bill is to be paid in full at the end of your stay with us. If you choose to cancel the whole reservation within 48 hours of the booking, or if your group numbers drop by more than 3 in the same period of time, 50% of the menu selected will be charged to the card provided. ● When notified of food allergies & intolerances we will take all due care to ensure meals or beverages served are free from notified products. However, we cannot guarantee that the meals or beverages will be free from trace elements. Please ensure that you notify us of any requirements 48 hours or more prior to booking. ● Running late? Give us a call on 9810 0097. Please note we will still require your igloo back after the original allotted 2 hours. Please note that your booking will be placed in our shared igloo. 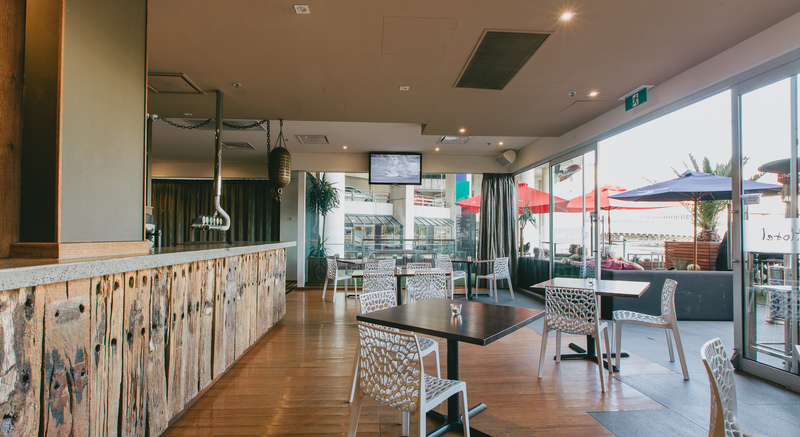 $49 pp includes Wharf Platter and a choice of beverage to share TERMS AND CONDITIONS ● Confirmation of your booking is required 48 hours prior to your booking time, don’t worry we will call to confirm! ● We accept all major credit cards or cash. ● We take credit card details as security only. The bill is to be paid in full at the end of your stay with us. If you choose to cancel the whole reservation within 48 hours of the booking, or if your group numbers drop by more than 3 in the same period of time, 50% of the menu selected will be charged to the card provided. ● When notified of food allergies & intolerances we will take all due care to ensure meals or beverages served are free from notified products. However, we cannot guarantee that the meals or beverages will be free from trace elements. Please ensure that you notify us of any requirements 48 hours or more prior to booking. ● Running late? Give us a call on 9810 0097. Please note we will still require your igloo back after the original allotted 2 hours. Please note that your booking will be places in our shared igloo. 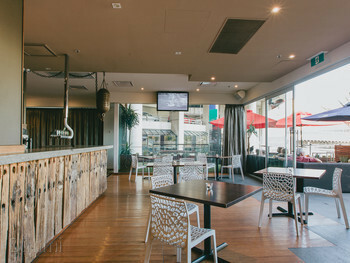 $49 pp includes Wharf Platter and a choice of beverage to share TERMS AND CONDITIONS ● Confirmation of your booking is required 48 hours prior to your booking time, don’t worry we will call to confirm! ● We accept all major credit cards or cash. ● We take credit card details as security only. The bill is to be paid in full at the end of your stay with us. If you choose to cancel the whole reservation within 48 hours of the booking, or if your group numbers drop by more than 3 in the same period of time, 50% of the menu selected will be charged to the card provided. ● When notified of food allergies & intolerances we will take all due care to ensure meals or beverages served are free from notified products. However, we cannot guarantee that the meals or beverages will be free from trace elements. Please ensure that you notify us of any requirements 48 hours or more prior to booking. ● Running late? Give us a call on 9810 0097. Please note we will still require your igloo back after the original allotted 2 hours. 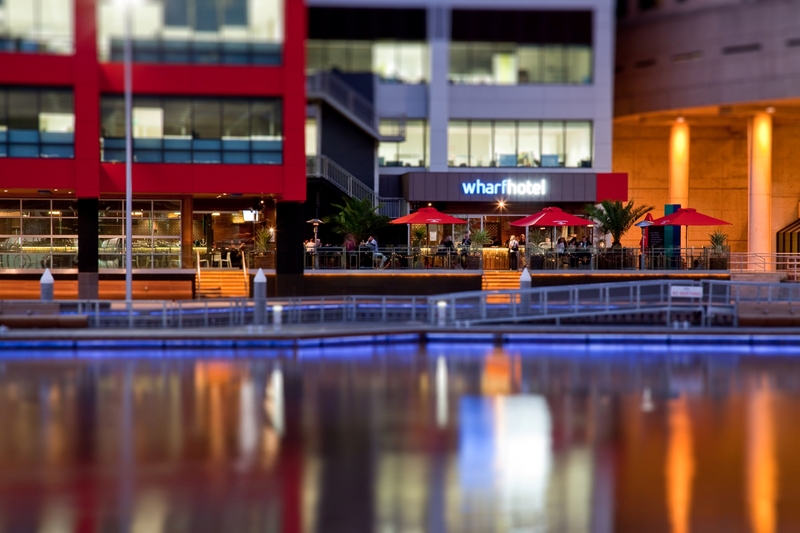 Wharfside wonderland Perched serenely on the banks of the Yarra, The Wharf Hotel boasts a relaxed modern-pub atmosphere, city views and a waterfront ambience. It’s the perfect spot for a drink and some sun soaking. 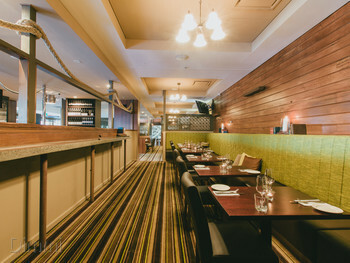 The interior is a wonderful mix of industrial chic and nautical inspired decor. 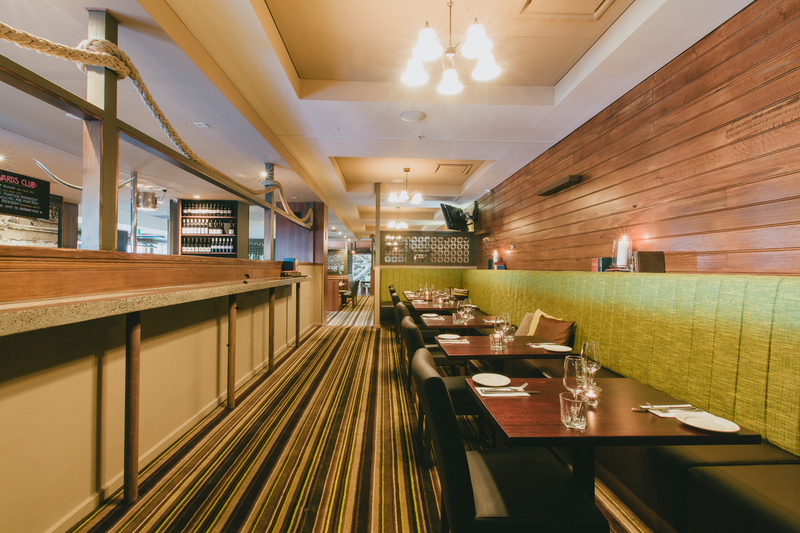 From classic parmas to cold pints, the menu boasts all the old pub-grub favourites with everything from pizzas, to burgers to curries. 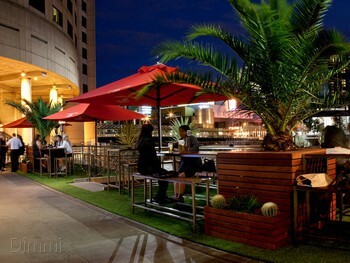 Take advantage of the open-air and undercover dining areas and relax. 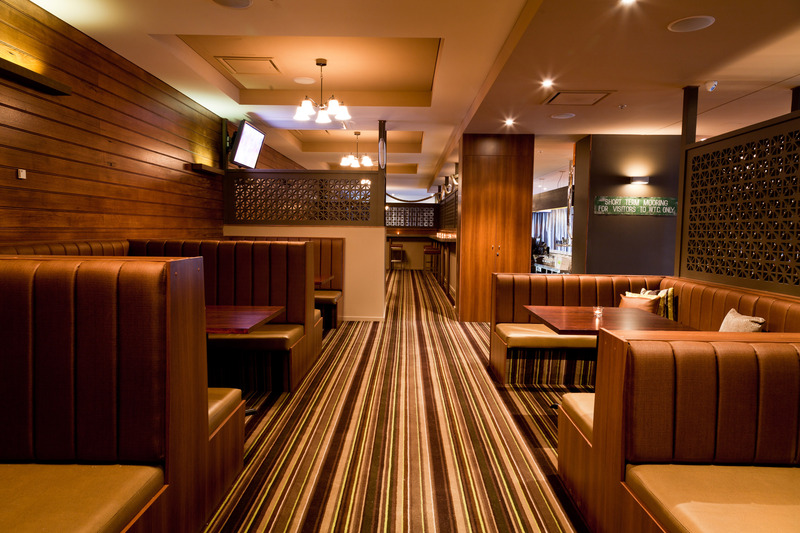 Catch the game live or sit back and croon along with Melbourne’s local muso’s, on live stage every weekend. This is also a wonderful place to come if you’re attending an event in one of the many nearby tourist attractions and its central location makes it easy to find and meet with family, friends or clientele. Get down to the Wharf! Best Dish: “Bang Bang”: chicken, sweet chilli, aioli & spring onion.